Good photography is about composition or in other words how the different elements in the photo and the main subject are placed in the frame of the photograph. 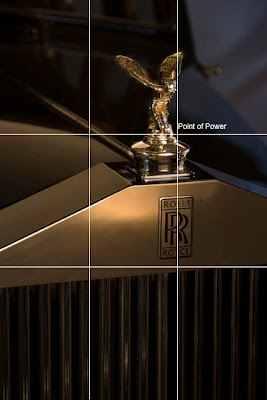 The Rule of Thirds is one of the most basic composition rules in photography. The principle behind it is that the frame of the photo is divided into 3 vertical and 3 horizontal sections of equal proportions. The lines that separate the sections are the compositional power lines that can be used to create clarity that helps the eye interpreting the image. For example in a landscape photo the horizon could be moved to one of the power lines instead of having it in the middle of the photo. This creates either the effect of wideness if more sky is shown or depth if the foreground gets the larger proportion of the frame. The intersections of the imaginary lines are called "Points of Power". It is good practice to move the main subject in the photo to one of the points of power. The main reason for this is that the eye in the quest of taking the image in breaks the photo into easier digestible parts and tries to identify the main information. It does that by finding the points of interest starting at the intersections of the imaginary lines. Hence the photographer can get the message easier across to the viewer if the main subject is at the point of power. The photo above demonstrates this with "The Lady" being placed at the point of power. The viewer knows instantly even without reading the Product Label what this photo is all about. The composition can be made even stronger when other lines in the photo point to the main subject as well. The eye follows the main lines when it takes the displayed information in. A line that is included in the composition should always lead towards the main subject. In this example the edge of the bonnet and the chrome linings all lead to the figure. This increases the weight of the main subject in the overall composition as the eye will always be guided back along the lines. Hi I am the principal photographer at AD Photography. AD Photography has photography studios on the Central Coast and in Sydney servicing all of Greater Sydney, Central Coast, Hunter Valley and Newcastle. We specialise in Wedding Photography, Portraiture and Commercial photography.